National Park Krka with its majestic and wild travertine waterfalls, medieval fortresses, monasteries and archeological sites, is one of the most beautiful destinations in Croatia. Situated in the Šibenik - Knin county, the second most visited national park in Croatia is comprised of 109 km² of the river Krka and the lower part of Čikola river. Read on and find out why you must visit this breathtaking, fairylike place. Of the larger Dalmatian cities, Šibenik is the closest to NP Krka - it takes only 20 minutes by car. A bit further you can find Zadar, an hour away drive. From Split you can get there in a hour and a half. So this makes NP Krka a perfect destination for a one day detour. Whether summer or winter, the Krka waterfalls are picture perfect in every time of the year. The biggest advantage of visiting this place off season are really good prices. If you intend to visit with your kids, you'll be happy with the fact that children under the age of 7 have a free entry fee. It's good to know that's the time of year when it's less crowded and the otherwordly beauty of the waterfalls is even more stunning. 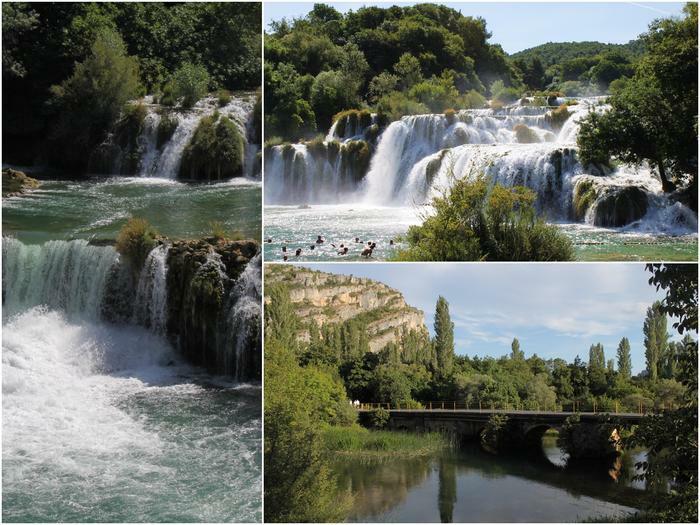 The beauty of waterfalls is not the only thing you can experience in NP Krka. Take a break from sightseeing: have lunch in a rustic restaurant or have a cup of coffee in some of the coffeeshops. Enjoy the atmosphere and the rustle of the waterfalls. For a more intense experience of the Park's wild nature, take a hike to some of the belvederes in the vicinity. For a taste of the past, peak into some of the old watermills. Still, it's best to sightsee by a boat. NP Krka offers boat excursions to Visovac, Roški slap, the Krka monastery and medieval fortresses Trošenj and Nečven. If you enter the Park through the entrance Skradin (one of the five offical entrances), every hour you can get on a boat that will take you to Skradinski buk. Keep in mind that other boat excursions and a guide you'll need to pay for separately from your entrance ticket. If you want to explore Krka's ancient history, visit the archeological site Burnum, where you can find remains of an amphitheatre with a capacity of between 6,000 to 10,000 people. There is also the unique Oziđana pećina, a cave that contains a collection of archeological findings from the neolitic, eneolitic and early and middle Bronze age. Every waterfall has unique characteristics that makes them different and special. 1. Bilušića buk is the only waterfall not affected by the energy exploatation of the river. But, throughout its history, it was mined four times in order to prevent floods in the neighbouring Kninsko polje. Despite that, it has managed to save it's beauty and charm. 2. You have to visit the Brljan waterfall in spring. The contrast of the pearly water and lush vegetation is most impressive in that season. 3. The highest waterfall of them all is the Manojlovački waterfall - measuring 32,2 meters. Since this waterfall is so big and really looks glorious, it is one of the most visited waterfalls, and many claim it's the most beautiful of all seven waterfalls. 4. Unlike the popular Skradinski buk, the Rošnjak waterfall remained intact because of its inaccessable position. The shortest waterfall, called the Altar by the old locals, because of its inaccessibility and simplicity. 5. The Miljacka waterfall is special because underneath it you can find the hydroplant Miljacka, which was once the most powerful hydroplant in Europe. In the vicinity, there's also Miljacka II cave, known for its endemic animal species like the olm (known by the locals as "human fish") and the long fingered bat. 6. One of the most beautiful and interesting experiences will be the phenomena of the "silver necklaces", at the very beginning of the sixth waterfall, the Roški waterfall. The silver necklaces are actually short cascades over which the Krka river overflows. 7. The most famous and the longest waterfall is Skradinski buk, specific for its unusual appearance due to the seventeen steps distributed along the 800 meters in length over which the river flows.